Xtian and I recently made a trip to Quebec City. It was a "first time" for me and of course the centuries old buildings, cobblestone, and romantic language won me over. 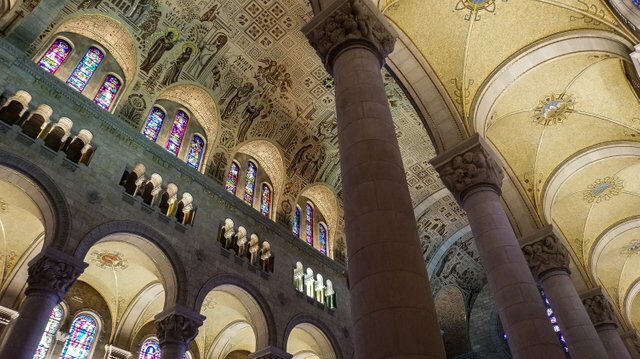 About an hour north of QC is a beautiful sanctuary named after the Mother of Mary, Sainte Anne de Beaupré. As the story goes, Anne and her husband Joachim were unable to conceive children for many years. A High Priest of Galilee rejected Joachim and his childlessness, deeming it an obvious sign from the divine as punishment. 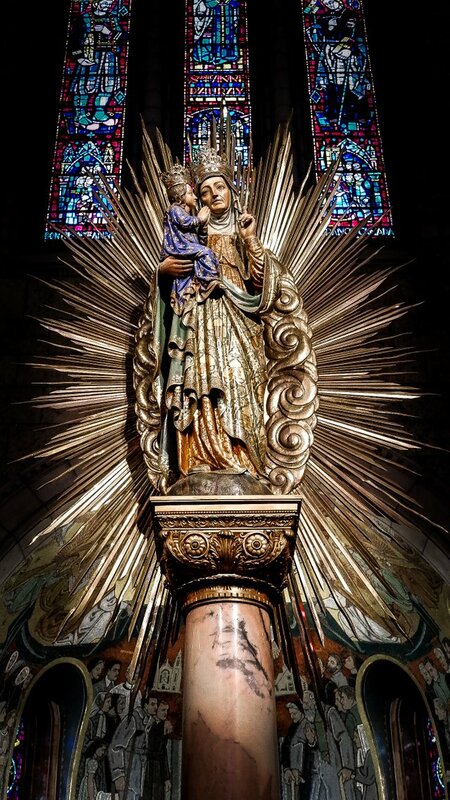 Joachim took to the desert for forty days until angels delivered a message that he and Anne would indeed have a child, Mary, the Mother of God, who would also have a child that would do wondrous things. I assume everyone is pretty familiar with how the rest of that story plays out, thus giving us Easter Eggs and chocolate fertility symbols. I snapped a few pictures of the small cathedral before putting my camera away. I felt awkward and somewhat disrespectful taking pictures in such a blessed place. 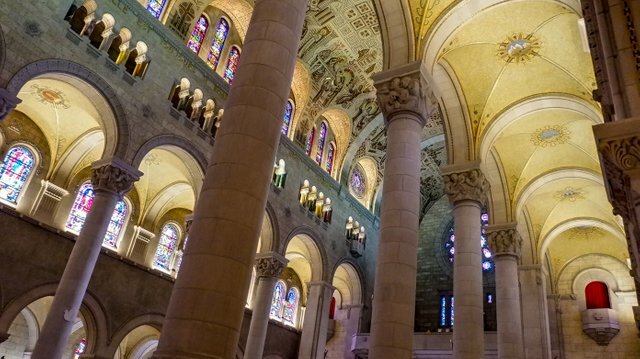 While I am not a Christian, I couldn't help but feel overwhelmed by the majesty of the architecture, iconology and the deeply held belief by millions world wide that these stories roots are based in reality and truth. 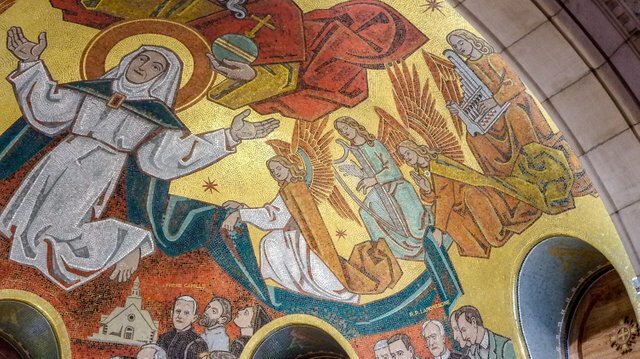 It's not visible with great detail, but the art and writing on the ceiling was mosaic in style and told multiple stories about St. Anne, Joachim, the Blessed Mother and the life of her son Jesus. 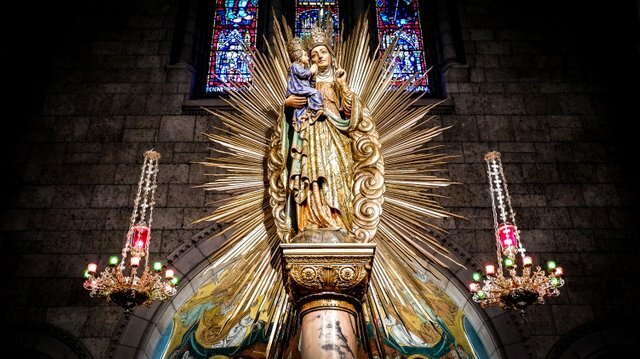 There were many pagan symbols carved throughout this Catholic house of worship; a reminder from the past that this seemingly ancient tradition is just a copy of something older.